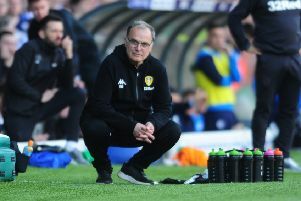 LEEDS United’s long-drawn-out pursuit of winger Anthony Limbombe looks to be over with the Belgian winger set to join Club Brugge for two million euros. Limbombe has been on United’s radar since last summer when Leeds tried and failed to reach a deal with Limbombe’s Dutch club NEC. The Whites eventually signed Jordan Botaka from Excelsior instead but the door appeared open for Limbombe to join Leeds when the winger walked out of training last week and expressed his desire to leave. NEC subsequently accepted a bid of close to £2m from Spanish club Granada but the 22-year-old is instead heading for Brugge on a four-year-deal for a reported two million euros. It is unclear whether United actually had a fresh bid turned down but either way chairman Massimo Cellino’s valuation of the player failed to reach NEC’s. Whites head coach Garry Monk is also known to still want to sign another right-back and a centre-half.